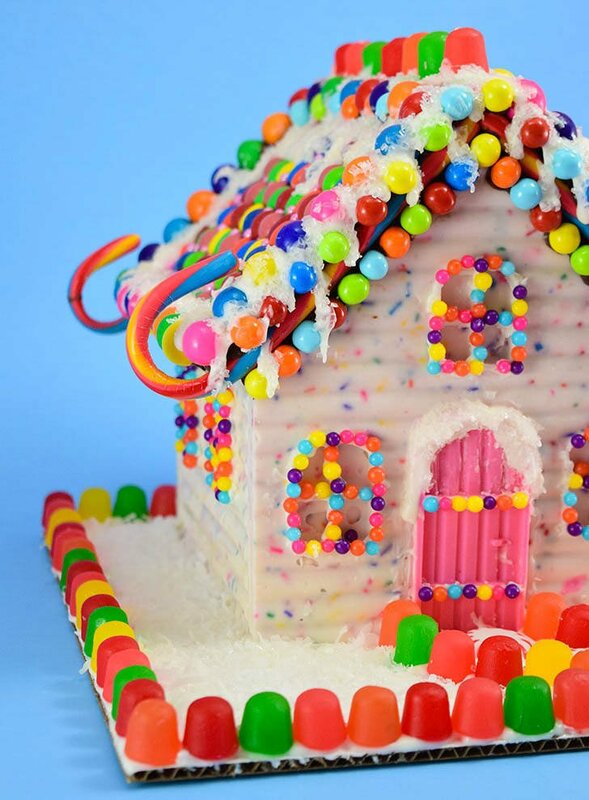 We didn’t make gingerbread houses when I was very little. They were a ton of trouble with making everything from scratch and cutting it out and all, I’m sure. 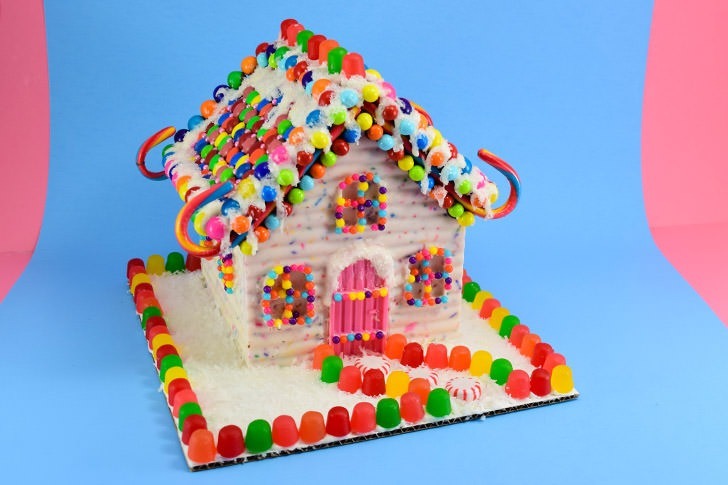 The first time I remember making one was in my teen years, probably, when we got a kit with pre-baked gingerbread walls and whatnot conveniently ready to go. The last time I did one of those kits was a few years back. My sister and her family had headed out to her husband’s family’s Christmas celebration and our side of the family was just sort of hanging out in her house. She had told me that there was a kit I could put together if I got bored and, of course, I did :) What I remember most about putting that thing together was that one of my eyes turned bright red and swelled up just a bit to be uncomfortable. I figure I rubbed my eye while working on it and got gluten in there. I still was new to the whole living gluten free business and wrongly assumed that it couldn’t harm me if I didn’t eat it. 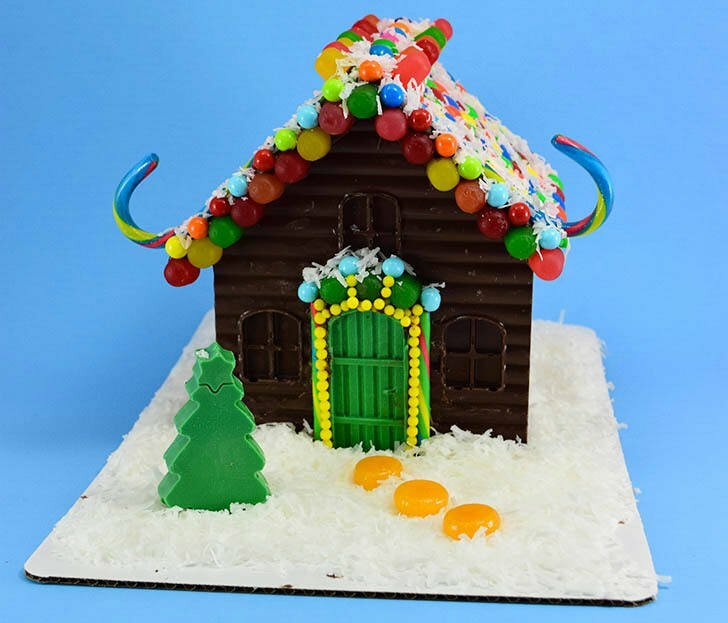 Since then I’ve sat and watched others make gingerbread houses and I very carefully offer assistance when requested, but I don’t get to make them for fun anymore. But I was thinking about how much fun they are to decorate when I decided I wanted an alternative. I ordered up a set of silicone gingerbread house molds and as soon as they arrived I got after it. My first attempt was with stuff I largely already had around the house, with the exception of the chocolate. I kind of consider it my tester version, as I often do with projects around here, and it’s okay but my second go with white chocolate is the one I love so, so much. And today I’m going to share them both with you along with tips and tricks I learned along the way building them both. 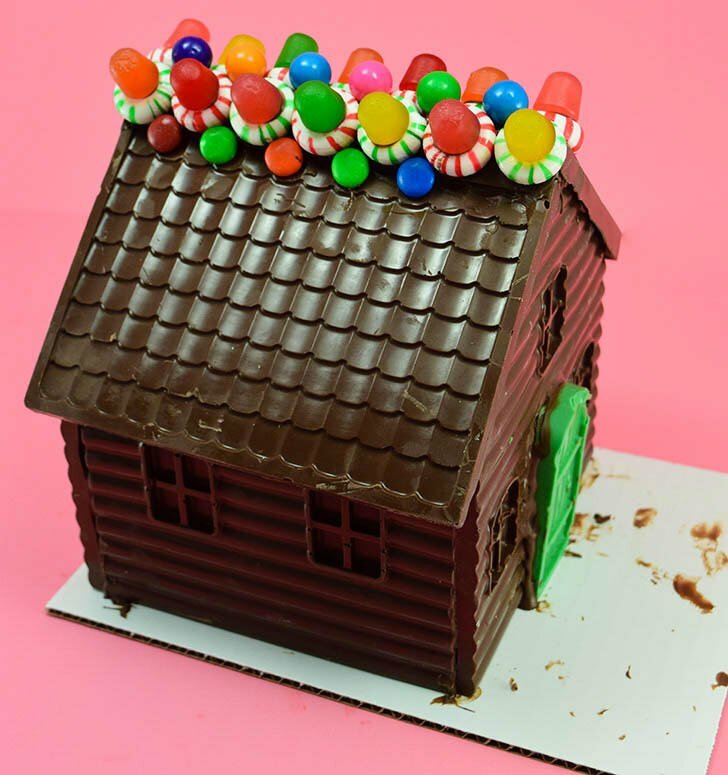 Want to see how to make these sweet little candy gingerbread houses that just so happen to work out super well for the gluten free? Let’s get it! 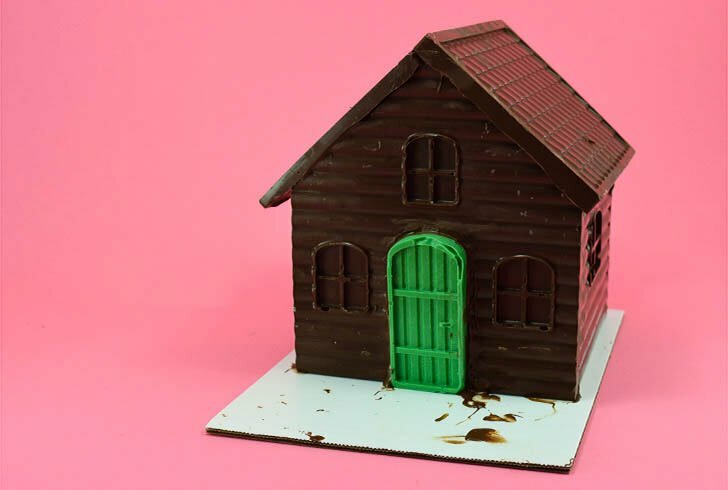 Just FYI, before we begin, from my research it seems that Plymouth Pantry Almond Bark is gluten free and it’s what I used as it is an inexpensive way to make these houses. I used it and didn’t have a reaction but feel free to do your own research or use your trusted brand of chocolate or almond bark if you have gluten intolerance. Melt your chocolate or almond bark in a glass measuring cup and pour into your mold. FYI, with the mold I used, 3 squares of bark will fill the front, back and individual roof pieces (each) and 4 squares will fill both side pieces. For each house I used almost 48 ounces of chocolate bark including melted chocolate to adhere decorations and waste. Allow the chocolate plenty of time to cool and set up firm. **Quick tip! You can place your molds in the refrigerator to speed up the process but be careful as your chocolate can sweat and mar the surface if left in too long. **Another quick tip! Be sure when reusing the molds that they are perfectly clean. Any trace of chocolate from previous moldings will appear on the newly molded and any water drops from washing in between molds can mar the surface as melted chocolate and water do NOT mix! 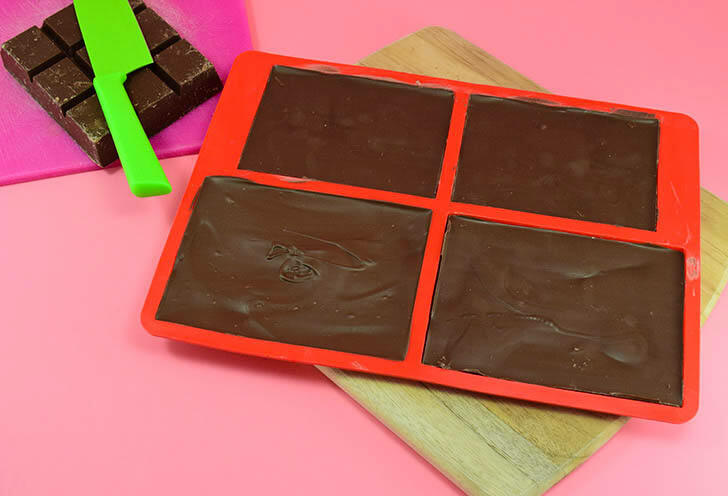 Carefully pull the silicone mold away from each piece, loosening the chocolate pieces little by little until freed from the mold. Use a sharp knife to trim away any odd edges. Cut down a cake board to a good size for your house. *Quick tip! Make the board larger than your house by at least an inch on each side so you can decorate your “yard”. In a candy piping bag, like these, place 1-2 squares of almond bark. Over normal heat zap the bags in the microwave, removing every 10-15 seconds to mash the chocolate inside to help it melt evenly. Once fully liquid you now have a bag of “chocolate glue”. :) Snip the end and use this bag, as Rob said, “just like a caulking gun”! 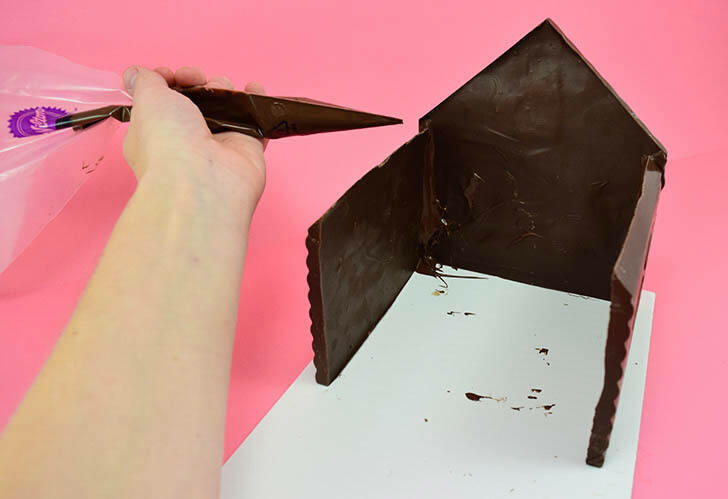 On your cut cake board take the back piece of your chocolate house and one of the sides. Stand them together, holding as necessary so they stay in place. Run melted chocolate from your piping bag along the seam where the two pieces meet. Hold in place allowing the chocolate to cool, set up and hold the pieces firmly together. Fill in any empty spots as necessary. 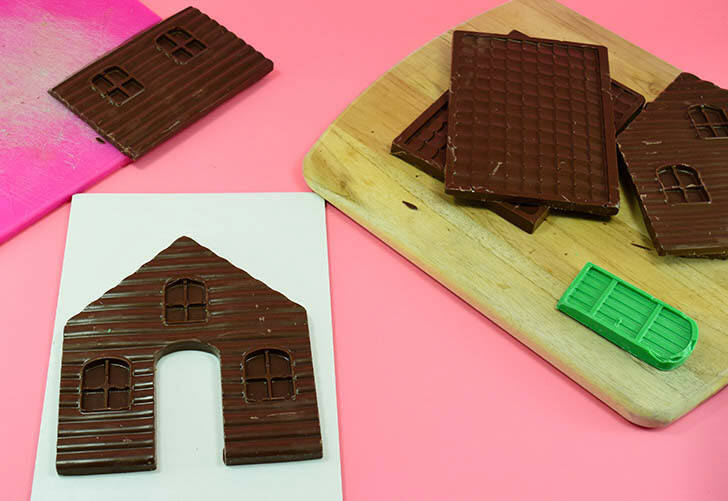 Run melted chocolate along the bottom edges of the pieces on the inside of the house to adhere the house to the board so that it doesn’t slide off. Continue this process for your remaining 2 walls and 2 roof pieces. 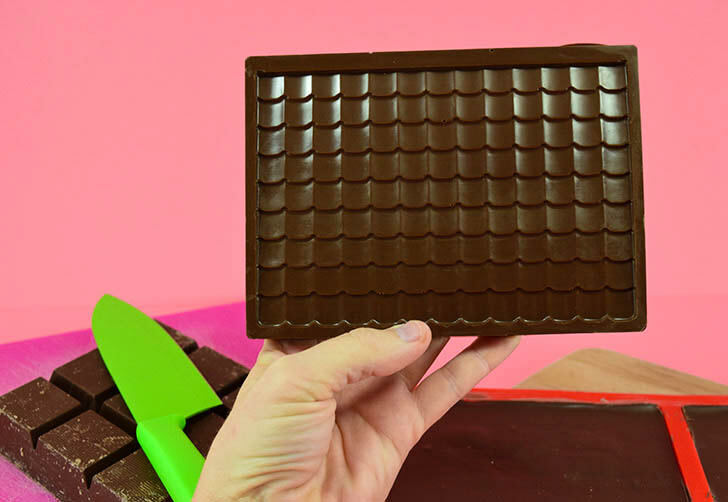 Be sure to hold each piece firmly in place as the chocolate “glue” sets so you ensure your pieces are in the correct position and don’t slide out of whack. ***Quick tip! Decorating things like windows and doors while vertical with hot melted chocolate can be difficult. 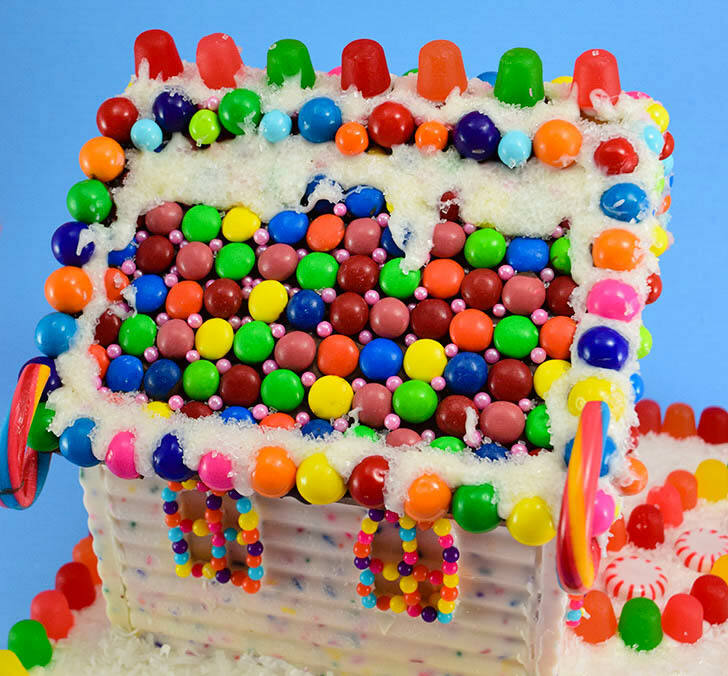 I recommend decorating with small pieces before assembling your house to save lots of time! 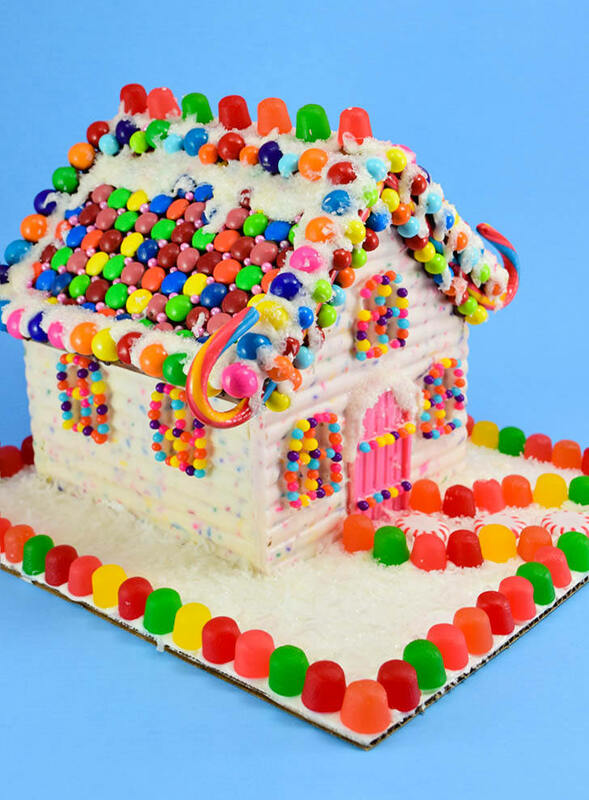 Refill your candy piping bag if necessary and begin decorating your houses with candies and cake decorations and the like… Simply apply a small amount of chocolate directly onto the house or onto the backside of your decoration and hold steady until the chocolate sets enough you can remove your hand and continue decorating on your merry, little way. And remember you can totally decorate the cake board, too! Create fences and pathways and even snow! Now I wound up moving my first house to a larger cake board. Luckily I “glued” that business inside and along the seams with so much chocolate it held together while I pried it from the old board, moved it over and glued it back down to a larger board. I also wound up removing the decorations from around my door and starting over after picking up some colorful candy canes from the store and after digging around in my baking box and found some nifty jumbo non-pareils (which as it turns out are possibly NOT GF, just FYI). **Quick tip! Want to remove decorations and start over? 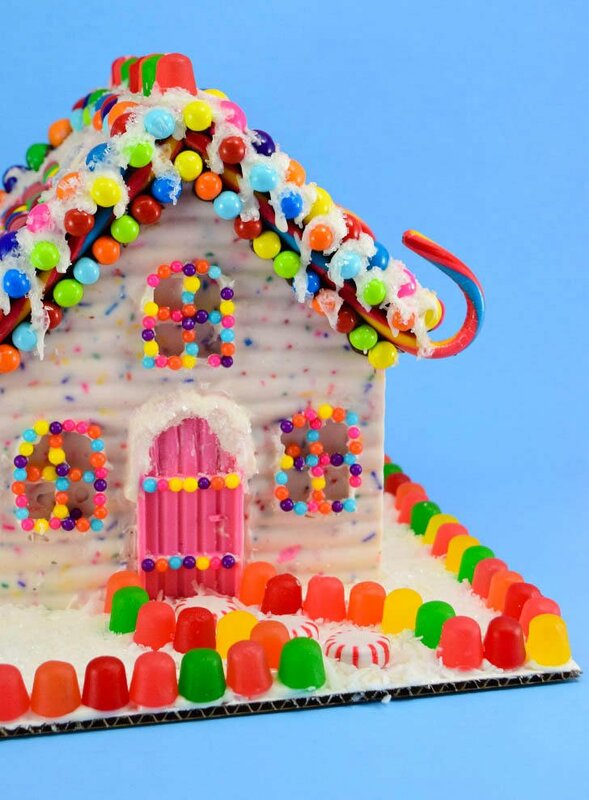 Slice away the old candy with a really sharp knife to create a clean slate to start over! 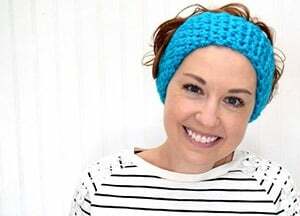 Isn’t it just too darn cute? For this version at the end of melting my white almond bark I added a handful of pastel sprinkles for that fun, flecked, fun-fetti style look on the walls. * Quick tip – if adding mix-ins to your chocolate don’t over do it. Too much will keep the chocolate from being sturdy. 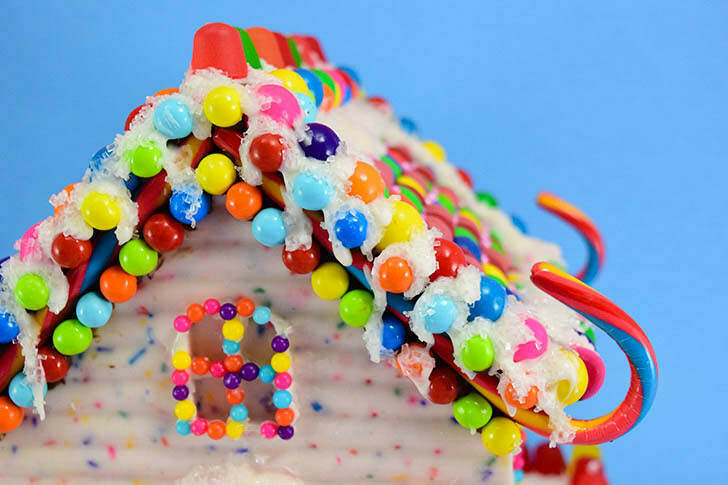 **Another quick tip – when adding in sprinkles keep stirring to a minimum to prevent the sprinkles from bleeding color, giving a marbled rather than flecked look. 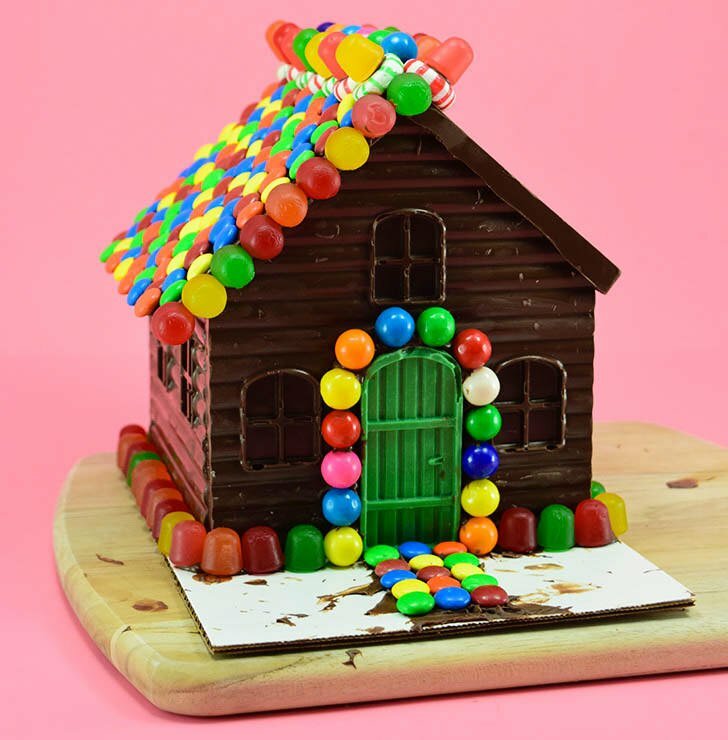 The roof was made from a 50/50 blend of white and brown chocolate almond bark to help the M&M and Skittle “shingles” more of a visual pop. 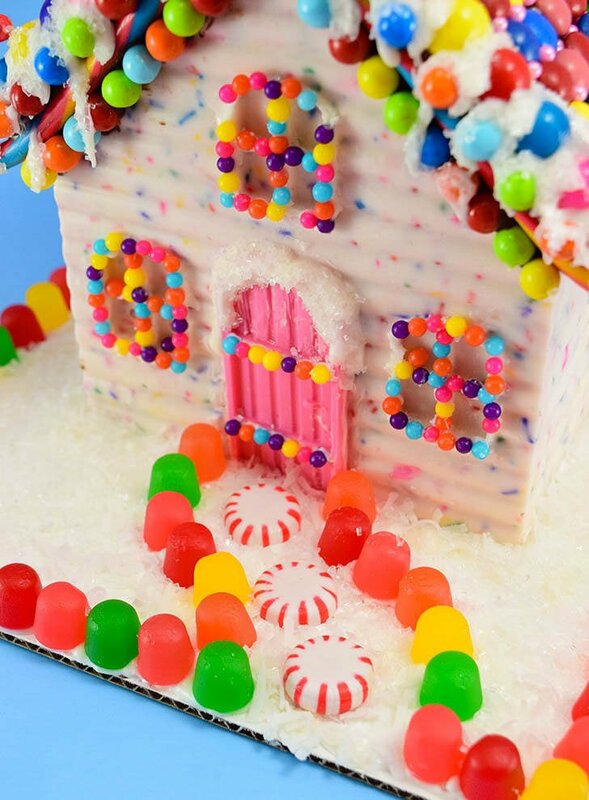 To add in some pink to match the pretty front door, I added pink sugar pearls in between those candies. For snow I melted white almond bark in a piping bag and, while super hot and runny, I allowed to drip around the edges of the roof and eaves. While the candy was still very liquid I tossed clear sanding sugar to give the snow and icicles that dripped down from it a fun sparkle. 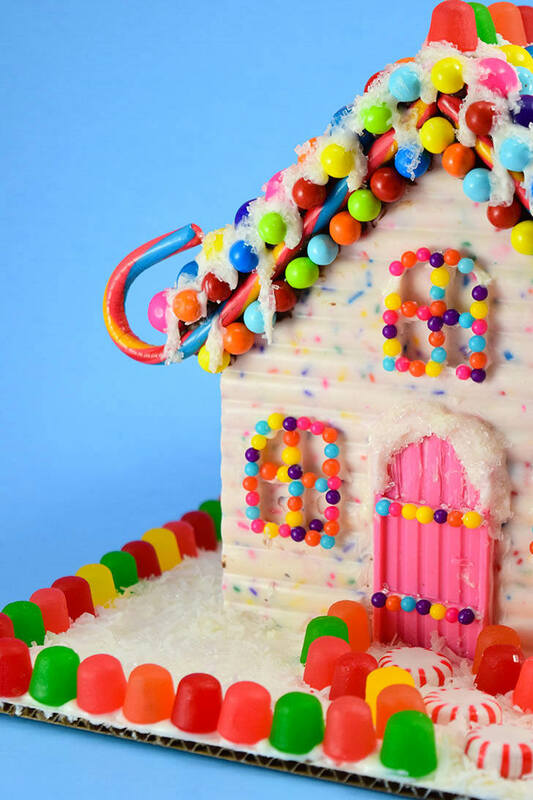 Candy canes on the front and back lining the roof gave the little candy cottage a fun, pagoda-style feeling and Dots placed on top of Brach’s hard candies covered the seam created where the roof pieces didn’t quite fit together. My little house’s yard was completed by covering the board in super sticky marshmallow fluff. Sweetened coconut pushed into the fluff took away the stickiness which holds the coconut cleanly to the board. A fence of dots lines the yard and helps keep stray coconut on the board and a pathway of starlight mints finishes up the scene. When it came down to it I used a TON of candy on these guys and, unfortunately, due to not paying close enough attention to the ingredient lists on my decorations I will not be able to partake in the sweetness BUT luckily friends and family can. I must admit I’ll be a little sad to watch it come apart because I’m just so fond of the outcome but I also know I can’t store this guy all year and having it eaten means I get to make another version in 2018!